What’s a young Amish woman to do when she lives in Fullerton on her father’s farm with little to no active social life? Why read, of course! And oh how Catherine loves to read Amish romances. Her favorite romances are by a particular author who loves to retell Jane Austen’s classics. Catherine can live vicariously through this author. After all, while Catherine’s life seems rather dull now, she knows that adventure awaits her! As the second oldest of eight children, Catherine has a lot of responsibility on her shoulders. Throughout the year, she helps her mother with all of the chores while her younger siblings are still in school. But Catherine isn’t one to complain. Sometimes when she’s weeding the garden or washing the clothes, she lets her mind wander and make up her own romance stories in her mind. Now, however, that summer has arrived, Catherine finds that she has more time on her own. Her sister Sarah can help with some of the chores which gives Catherine more free time. But she chooses not to go to youth gatherings. She’d rather stay home with her books than risk having to turn down some young man who wants to bring her home in his buggy. None of the boys in her home town are anything like the heroes in her romance novels! When their neighbors Duane and Wilma Anderson stop for a visit and asks permission for Catherine to accompany them on vacation with them to Moreland Lake near Banthe, summer begins to look a bit more exciting! 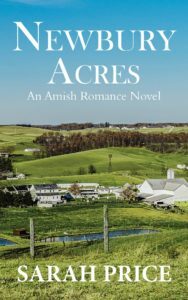 Could she possibly experience life like in those Amish romance novels? More importantly, would she really want to? Find out on March 21, 2017 when Newbury Acres is released! Click HERE to pre-order!